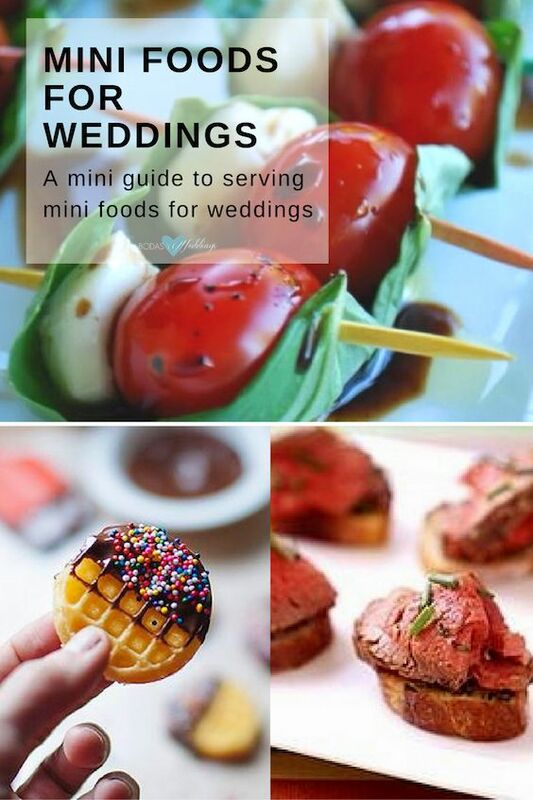 A mini guide to serving mini foods for weddings. Why serve them, how are they different from appetizers. Even how to estimate the number of pieces per guest! Read on! Add some maple syrup on the side for those guests that want to go the extra mile. 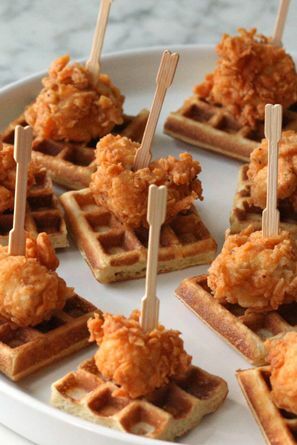 Mini fried chicken and waffles. 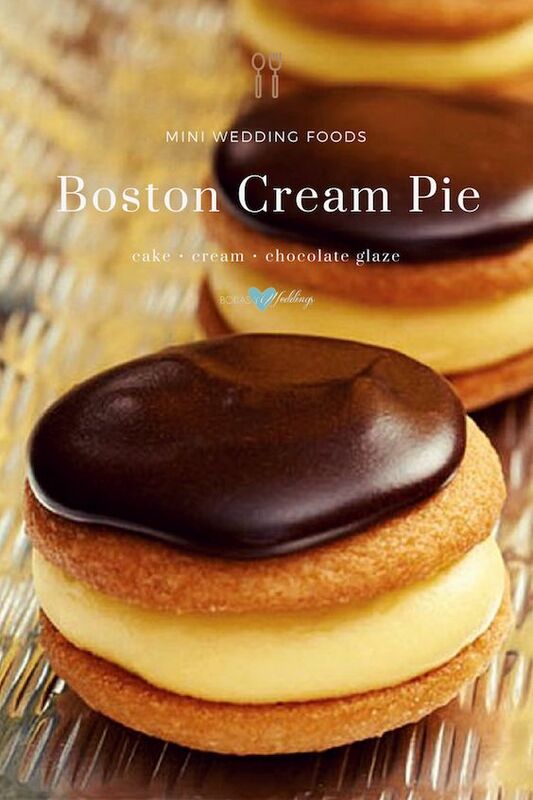 Take a bite out of this catering option for your big day: mini foods for weddings. Plainly adorable miniature versions of our favorite dishes, super Instagrammable and too cute to eat. 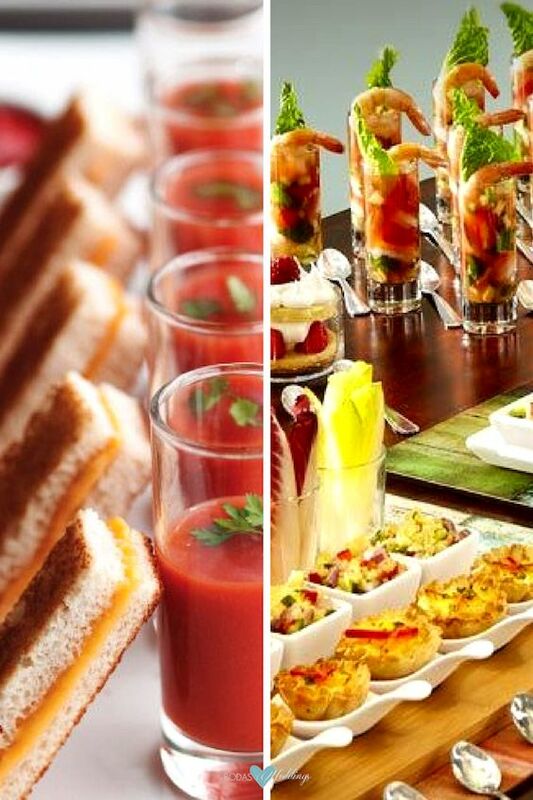 Do not miss these mini wedding food ideas, a trend that’s definitely on fleek. Mini foods, fancifully called hors d’oeuvres, are the cutest thing to grace your most romantic day. Fun and dynamic, delicious and handy. 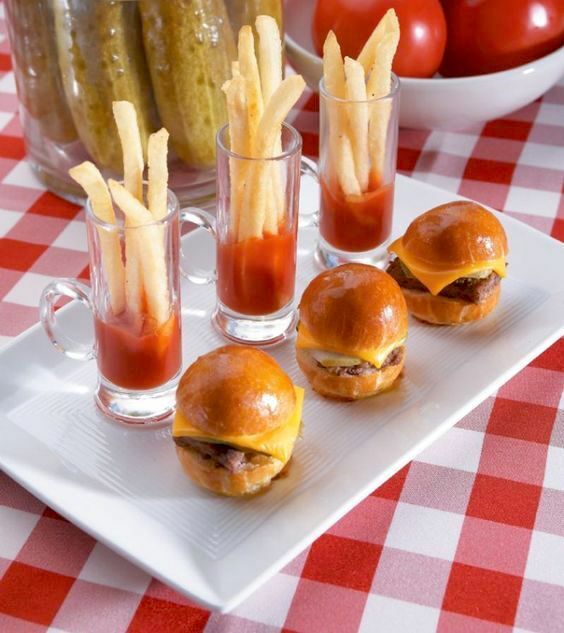 These miniature foods will impress your guests with their creativity and masterful catering presentation. 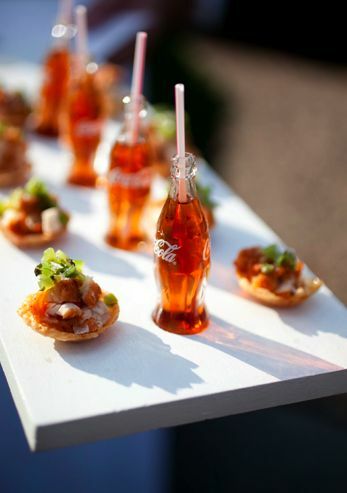 From cocktail hour to full-blown dinner, let’s uncover the art of serving mini foods for weddings. 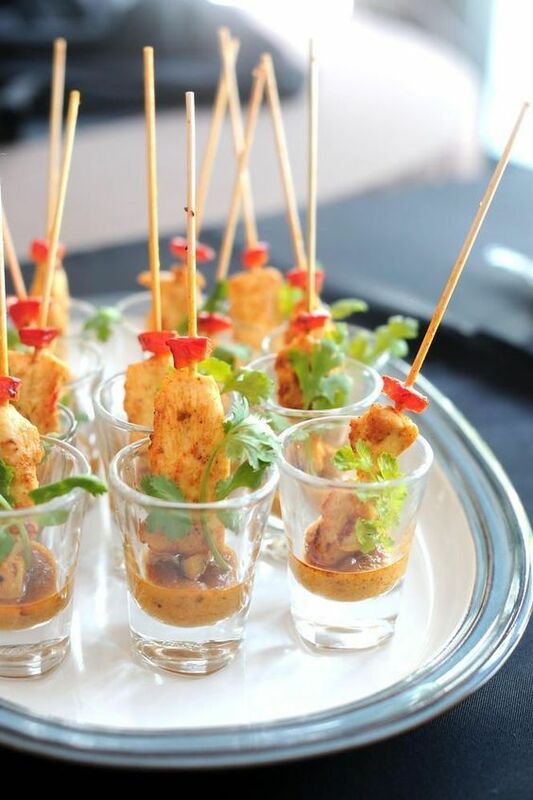 Why Serve Mini Foods for Weddings? For their beauty and art, of course. Moreover, who doesn’t dig a variety of flavors? Some couples even dedicate their entire wedding theme to the wholesomeness of mini food. 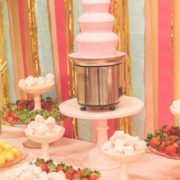 From mini meatballs and spaghetti or pint-sized bites of chicken and waffles to ice cream cones or deviled quail eggs, there are hundreds of options of mini food for weddings. 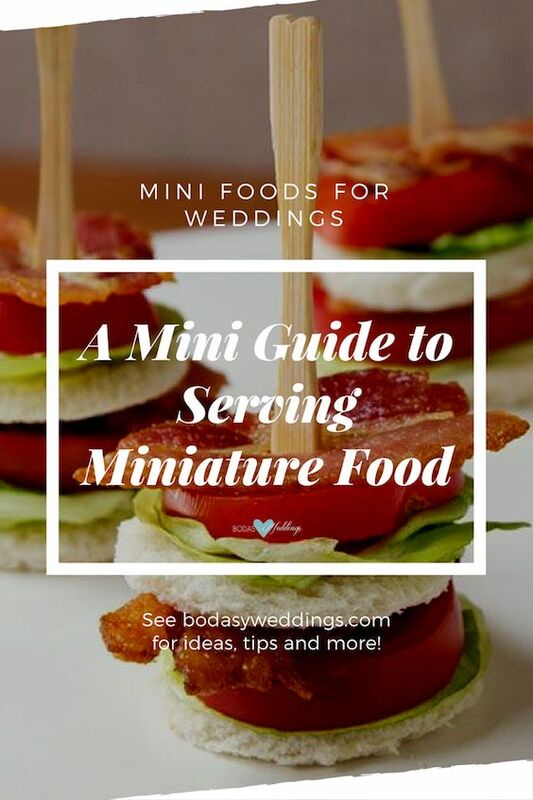 Mini foods can spice up your reception, cocktail hour, or even the dessert portion of your wedding. Moreover, if you are going for an appetizer streak, mini foods for weddings can bring that over-the-top relish to your occasion. Adorable miniature versions of your favorite dishes, super Instagrammable and too cute to eat. 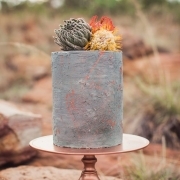 Do not miss these mini wedding food ideas, a trend that’s definitely on fleek. 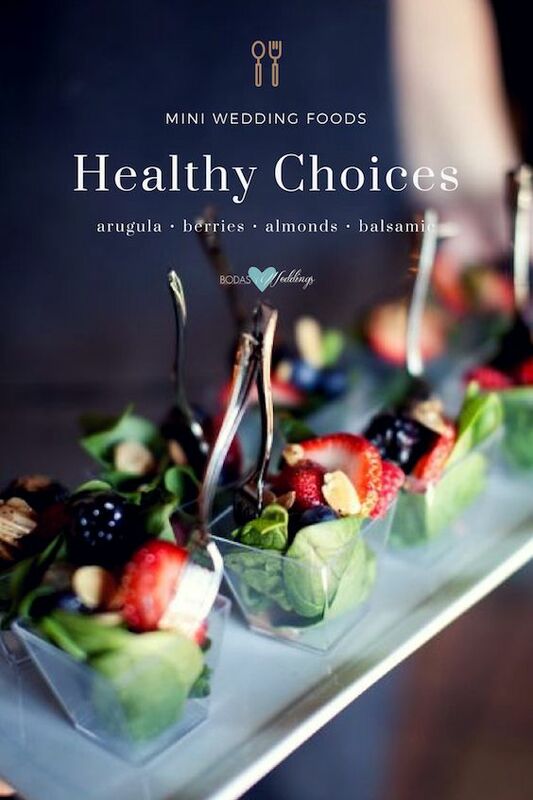 Catering of mini foods for weddings can also include some healthy choices like these delicious mini salads. Photographer: Beca Rillo Photography. What is the Difference between Appetizers and Mini Foods? Mini foods are finger foods—one-bite delights that can be either passed or stationary. Like bruschettas, crudités, and sticky spicy sesame cauliflower wings, mini foods can be served separately from, prior to a meal or as the main wedding food. On the other hand, appetizers are slightly larger in size and eaten as first courses when seated at the table. 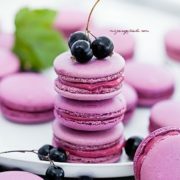 They are also prepared in a way that complements the main course and dessert courses to follow. 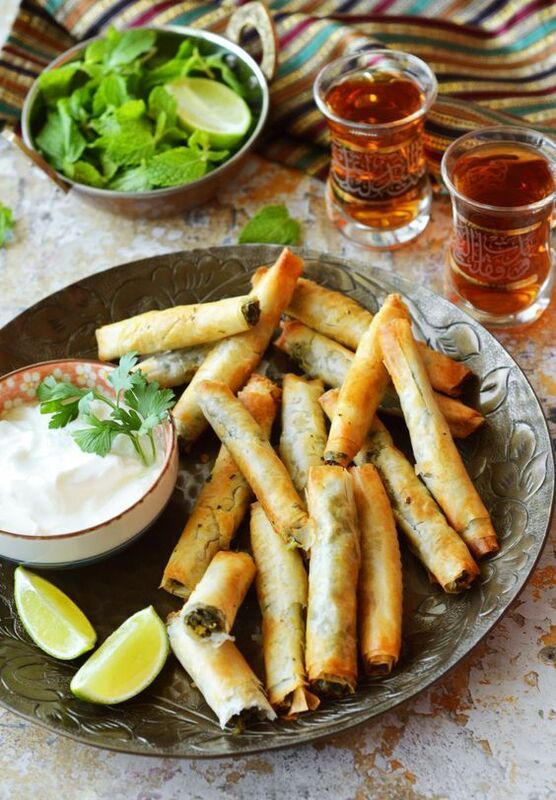 Great finger food for cocktail hour: mini spinach feta rolls. Definitely on fleek. Mini rum and coke in mini-sized vintage coke bottles served with mini food. 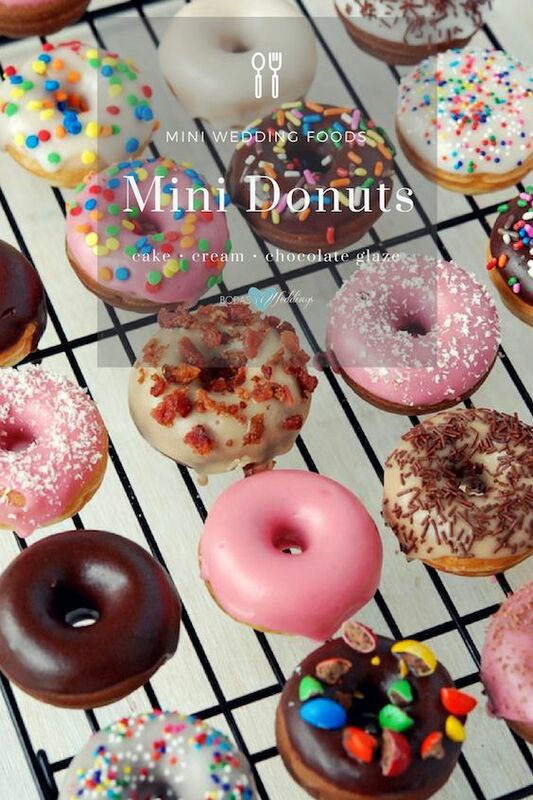 How much are we loving this mini food craze? 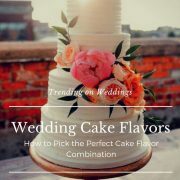 If you have made up your mind and are going for the mini foods for weddings craze, here’s some planning tips that will help you make choices that fit your budget. How Many Pieces Should I Estimate per Guest? Let’s be real here: you don’t want to send your guests home hungry; neither do you want to waste excess food. Mini foods for weddings require a bit of tweaking. At cocktail hour, estimate 2-4 pieces per guest before entrée. 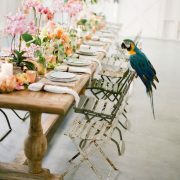 While 5-6 pieces per guest can be estimated after the main course. For dinner replacements, 12-14 pieces per guest will do just fine. Of course, for a better assessment, take into consideration how filling or rich your choice of mini foods is. Heavier, creamier concoctions or chocolate-filled bites will demand less pieces than the more fruity and summery dishes. Mini caprese, mini waffles dipped in chocolate & let the sprinkles add to the fun, and mini filet mignon with garlic toast. 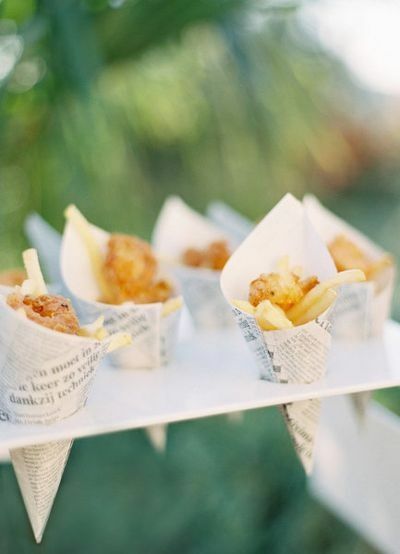 Mini fish & chip cones. How original is that? Stack a few mini pancakes and top with berries. Recipe and Photo: Stone Wall Kitchen. Let’s Talk Cost and Budgets: How Much for that Mini Food on the Window? Contrary to reducing overall cost, mini foods for weddings might be a more expensive option. The thing about mini foods is that they are labor intensive—the sheer creativity, perfection and attention that goes into creating these beauties. It all depends on how elaborate or simple they are. You might save on reception staff versus a seated dinner. So consider how you plan on serving them! When it comes down to mini wedding foods the presentation is key. 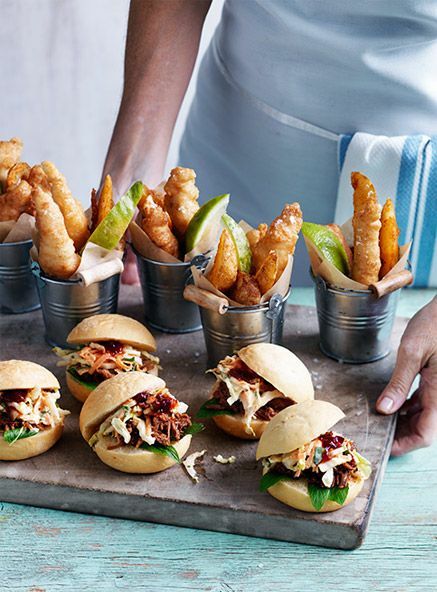 Check out these mini buckets and the wooden table used to serve these pork sliders. These mini food ideas for weddings, a take on the American classics, perfectly presented to match an industrial wedding decor. Impress your guests with unique and creative small bites. 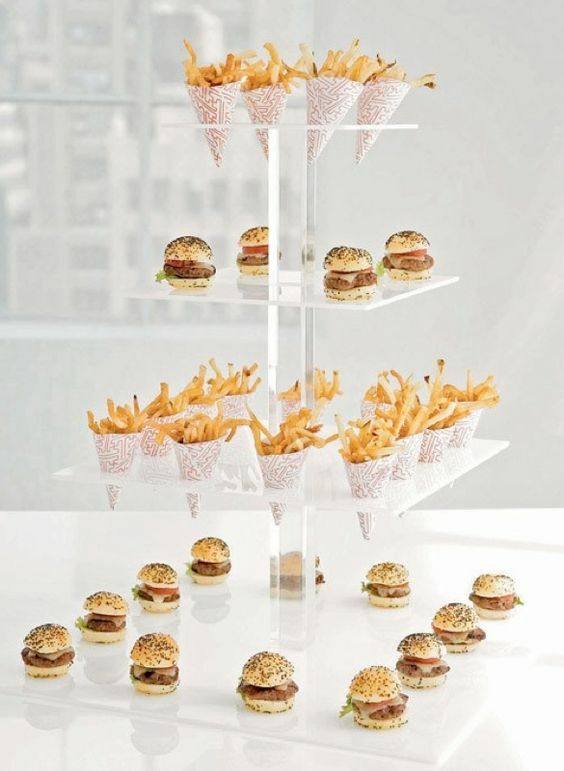 Jump onto the mini foods for weddings wagon! Mini mac and cheese bites recipe. Easy and economical comfort food. 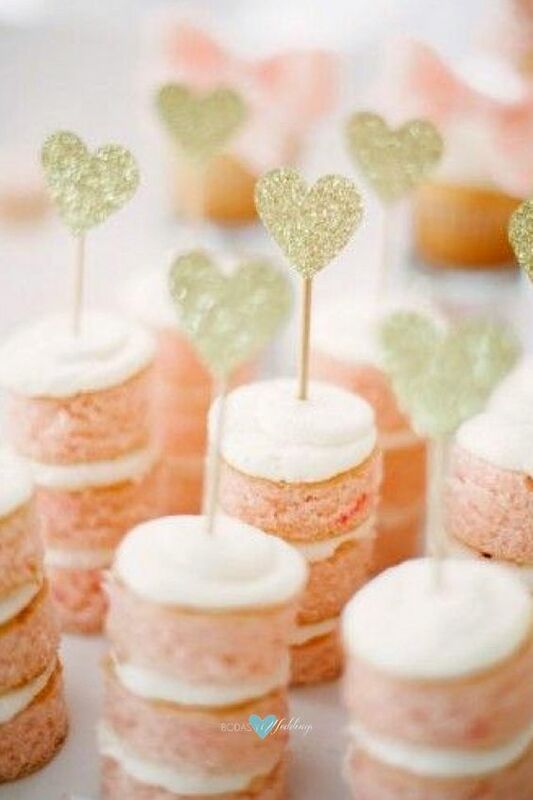 Dainty mini pink cakes with gold heart toppers. Double stacked and open faced mini version of the classic BLT. A sweet bite that’s cute and tasty. Mini doughnuts for your dessert table. 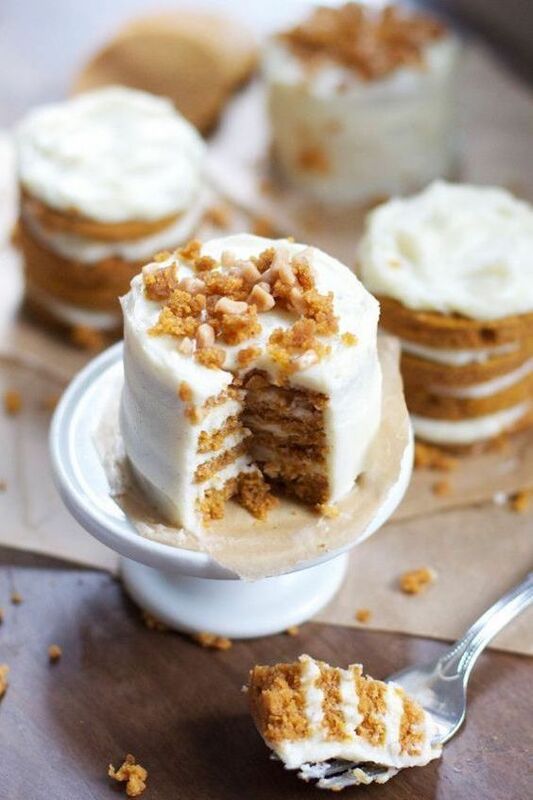 Perfect for a fall wedding dessert table. Mini foods for weddings pairing ideas. 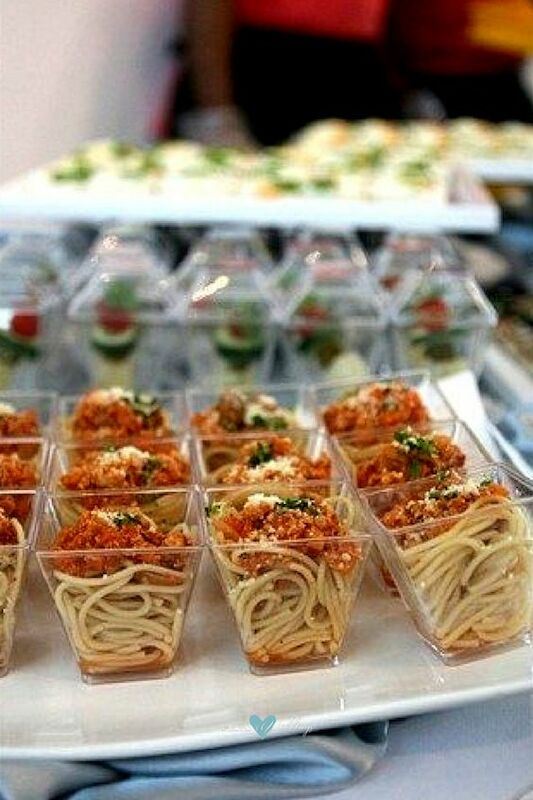 Pasta is affordable and super cute when served in a glass! Thai satay sticks, flavorful and simple way to make mini food. 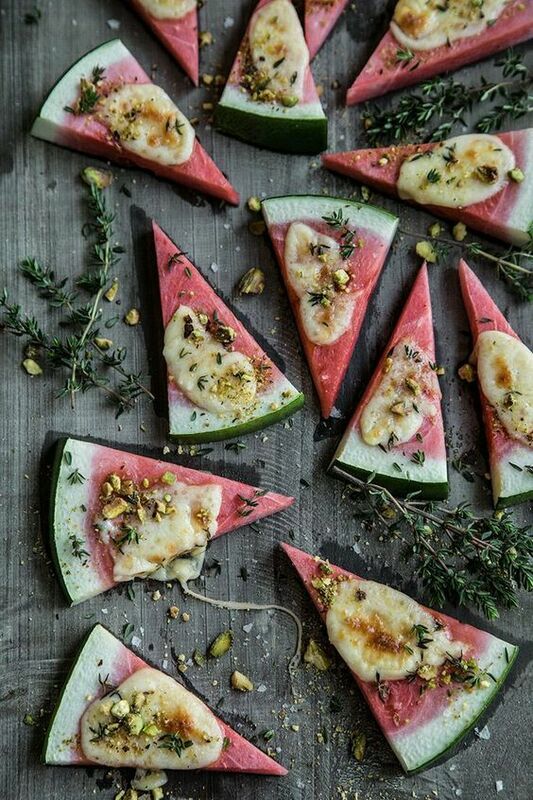 Watermelon with melted mozzarella and herbs. 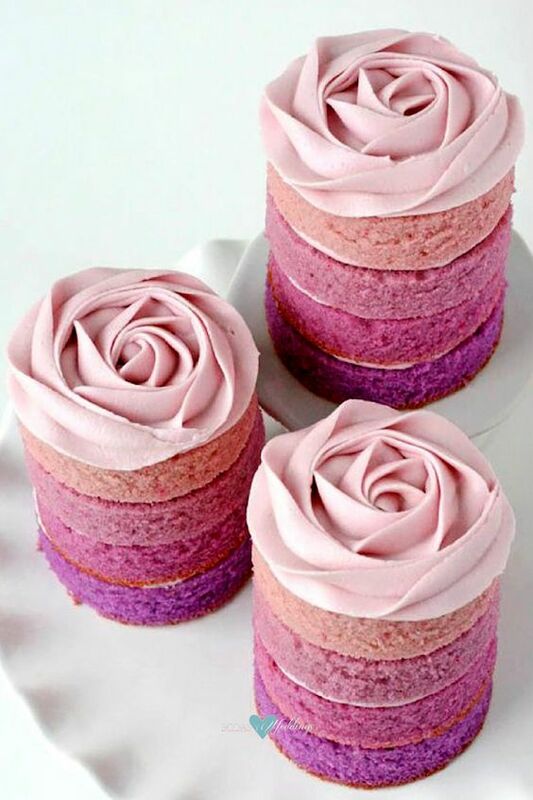 Purple ombre mini cakes by Glorious Treats. 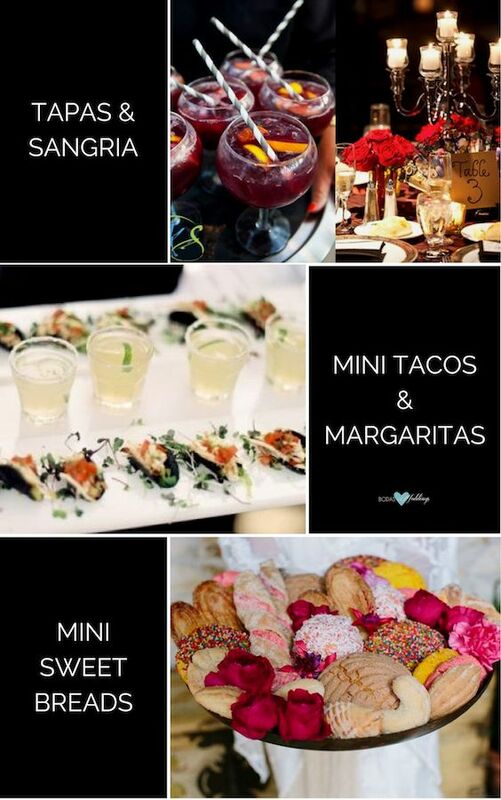 Super Cool Idea: Pairing Mini Foods and Mini Drinks! Who says we can’t get tipsy with mini foods at weddings? From the Blushing Bride (champagne, peach schnapps, and grenadine) paired with mini fruits to a classic bourbon and bacon chicken skewers, the possibilities are endless. Talk about creamy coconut margaritas and loaded nacho chips, or honeyed whiskey lemonade and mini macaroni and cheese stuffed biscuits — mini foods for weddings are sure to make a statement. Who can turn down lavender lemonade mojitos and goat cheese? Or resist a crowd-pleasing combo of tangerine cocktail and prosciutto wrapped peach slices? Oh, my! Who says we can’t get tipsy with mini foods at weddings? 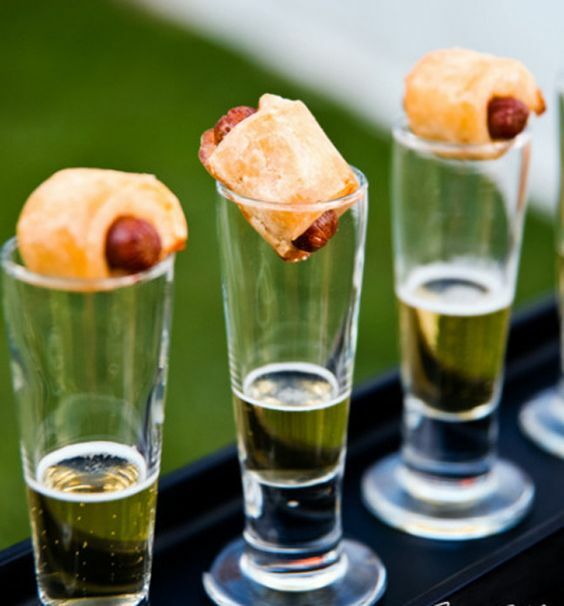 Pair mini pigs in a blanket with a shot of beer. A wonderful flavor combination. Such a cute pairing! 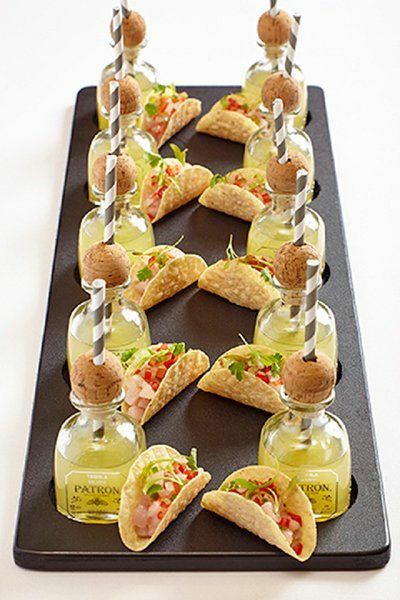 Mini Patron tequilas with taco bites. 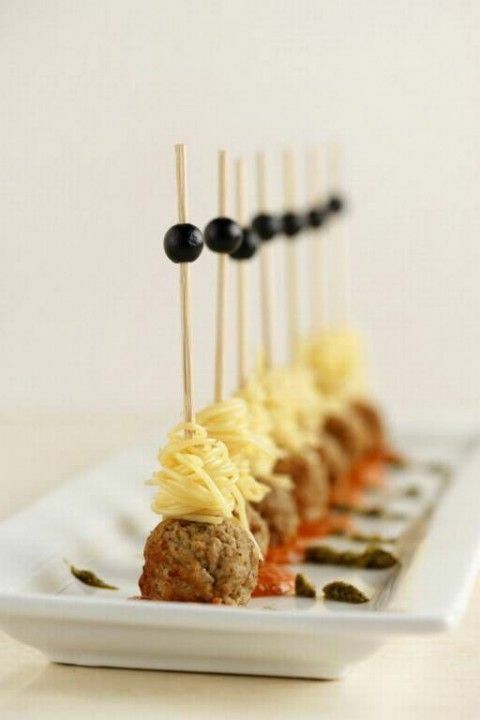 Mini spaghetti and meatballs, a great opportunity to serve a good Chianti. Don’t forget to check out these sustainable catering ideas or this guide to plan a food truck wedding. The wedding menu is one of the main ingredients for happy guests! 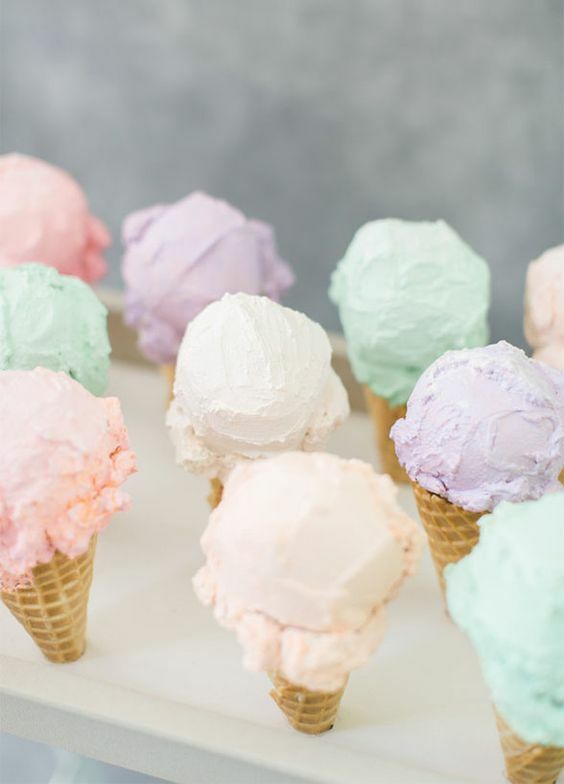 Mini ice cream cones in pastel colors. Cute, lovely and delicious. Serve some mini burritos already made or let your guests top their own. Recipe for mini taco stuffed peppers: stuff the mini bell peppers with ground meat and drizzle them with cilantro cream sauce. 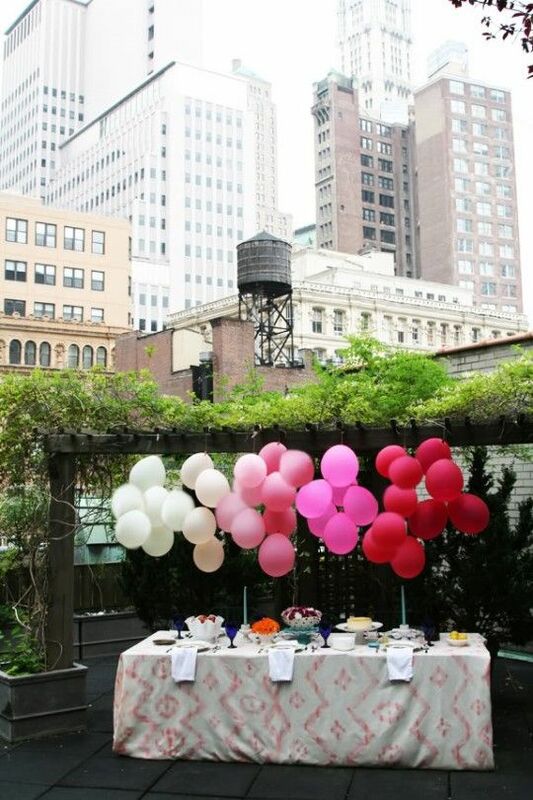 Lovely balloon decor for the mini wedding food table at a rooftop or backyard. 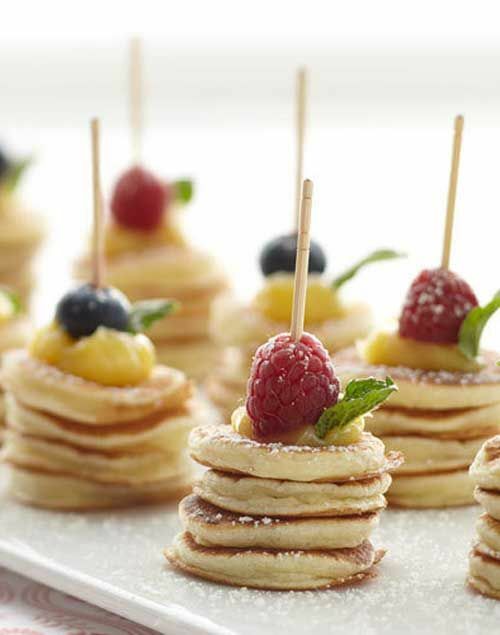 Mini pancake pops for a very interative buffet. 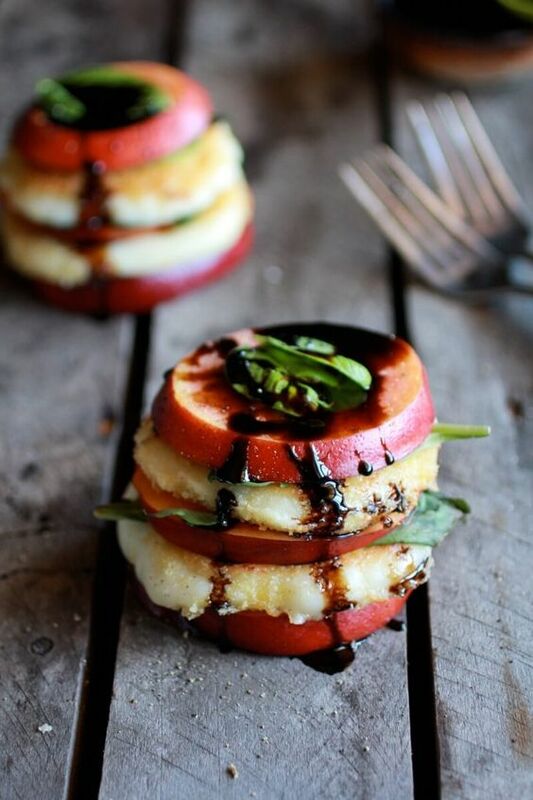 Serve with a choice of squash, goat’s cheese and rosemary or caramel sauce. Let your guests take their pick! 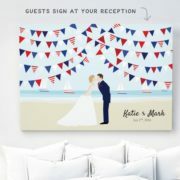 Yours is an amazing wedding site! So beautiful and chock full of great information! My wedding has been influenced by your ideas a LOT!! Thank you!! Thank you!! 🙂 It makes us all very happy to hear! !